Interests:10th Battalion, The Gordon Highlanders, and all Battalions of The Cameronians (Scottish Rifles). I'm moving into unknown territory and floundering right at the starting point. I have come across a kind of memorial certificate in a local archive to five people from Airdrie, Scotland. Four of them are men and one of them is a young woman, Agnes C McDonald. At first I thought she perhaps survived the war as I couldnt find any mention of her on either the CWGC or the SNWM databases, however, there is an Agnes C MacDonald on the Airdrie War Memorial. I have no idea where to start looking for information on this lady. I would ideally like to know where and when she died, and what service she was in. The certificate lists her as Motor Driver so would this be some kind of Transport corps? I'm curious as to why she is on the War Memorial and not on the CWGC or the SNWM. I also tried to find a medal index card but I'm not even sure if woman had one or not. I'm hoping that someone can help me as I have absolutely no experience of researching women in the Great War. 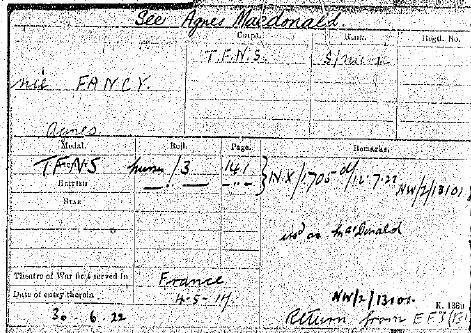 There is a WW1 Medal Card on the Nnational Archives site under 'MacDonald, Agnes.' She is described as being a Staff Nurse with the Territorials. Could she have driven an ambulance? There could be several reasons why a female 'driver' does not appear on the CWGC list. She could have been a volunteer in a non-recognised organisation or been in one of the civilian organisations which did qualify for CWGC listing but only if they died on duty and of a war cause. In the latter case, she may have not met the qualifications. There are many cases of people on local memorials who did not qualify for CWGC for one reasons or another but the local people still thought they ought to be included. We need more info. Where's Jim Strawbridge when you need him? I think you hit the nail on the head with the ambulance driver. When I get home i'll download the card and see what it says. Thanks for that Terry, i'll try and have a look at the Airdrie Memorial Roll and see if she is mentioned in that. I'd be interested to know when she died, any suggestions? No, she couldn't. There's no way that a Territorial Force Nursing Service staff nurse would have been driving an ambulance. She would have been nursing, not driving. Here I am. I have no record of this woman. As she appears nowhere else but the Airdrie War Memorial I shall stick my neck out and suggest that the War Memorial commemorates all those that served from the area rather than those that died on service. Have you checked the wording that heads the list of names? The MIC should say whether she died. The only other real alternatives is that she fell ill and resigned from service before her death and therefore did not appear on their roll. "In memory of the men of Airdrie who gave their lives for their country in the Great War 1914 - 1919"
Strictly speaking it should say 'men and women' I guess as she is on there. I'll try and get her MIC and see if it mentions her death, although that probably wont be much help as regards to when or where she died. I'd like to look her up in the local newspaper but without any dates, its not looking hopefull. Thanks for your help everyone, much obliged to you all. 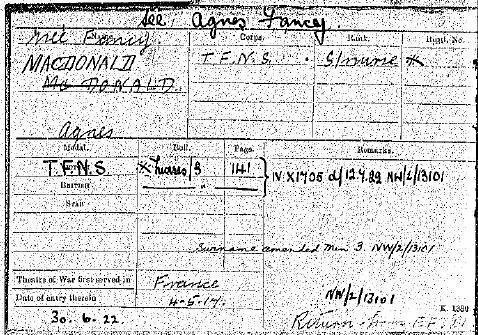 There were five Agnes M*cDonalds living in Airdrie in 1901. Obviously she could have moved there later but in 1901 their ages were 0 (2 of them), 9 , 35 and 40. A cross-check shows she could be Agnes Clark McDonald who was born in the Milton district in 1900. Not Airdire, I know, but a possibility. Keep her in mind as you look for further information about her. I'll check the "Airdrie in the Great War" booklet the Society has on CD. It was published in 1915 (the book, not the CD!) so she might not be mentioned, but it's worth a try. Thanks again for all the help and advice people, much appreciated. I finally downloaded the medal card of Agnes MacDonald, hoping that it is the same woman. It turns out she has two medal cards, this one and one under the name of Agnes Fancy. I downloaded it too, still no Agnes Fancy on CWGC or SNWM though. Here is the first MIC I downloaded, anyone any ideas on what its telling me? I'll stick on the other one in a mo. Jim, I'll try and get a photograph to you asap. I have no record of a female casualty with the name of Fancy either. I see that there is no mention of "deceased" on the MICs and that June 1922 is given. Getting a bit late to have been a casualty if she died after that date - but just possible if through the effects of war. I'll be sure to keep you posted if I find anything out. I'll try and get that pic taken in the next week or so. I'd hoped that my previous comment on the thread would have saved you £7, but unfortunately [for your pocket] I wasn't making the point very well. And, hopefully, lived a long and prosperous life. I'm sure I could get the money refunded to me from work, but it'd probably take about six months to get it! In the archive where I found this original certificate is the original documentation for the war memorial, basically a big long list of names. I'm hoping it may well have some etxra details as to unit and possibly date of death. I think i'll do myself a big favour and have a look through that. I've had a look at the "Airdrie and the Great War" book. She's not in it. There is a large group photograph of the 30th Lanark V.A.D. but there are no names for the photo. There is als o a page of "Airdrie's Nurses" and she isn't one of them. Strangely though, there are five nurses with the surname Motherwell, which I find very odd. Two of them are called Agnes. I'm really enjoying the hunt, keep up the good work all. It might be worth starting with a search for a death certificate - there must be one. Making some assumptions - she probably died in Scotland, and was more likely [as a woman] to have fallen victim to illness, especially influenza/pneumonia in 1918/19/20. If you search the indexes on 'Scotland's People' you could note all Agnes Macdonalds [hopefully Agnes C. Macdonald] between say Jan 1918 and Dec 1922, and even if you are left with several, the approximate date of death, even without a certificate, will narrow your newspaper search enormously. You might even find one very likely candidate that makes it worthwhile to get the certificate. I would also keep very open-minded about what she did - the thread has got a bit obsessed with nurses, but she probably wasn't one - so no headlines saying 'Airdrie Nurse Dies... ' etc. And just in passing - I did look at the file at the National Archives for Agnes Fancey/Macdonald, whose MICs you have, and that is definitely a different story. If you'd like the details from her file, just to go with the cards [and make your £7 a bit more worthwhile], email me and I'll send them. I have tried a couple of searches on the Scotlands People site for a death certificate. Trouble was I was struggling to find matches from this area. I know she didn't neccessarily have to die in Airdrie [New Monkland Parish] but, and here is where my thinking may be totally wrong, if she didn't die in war service, and she wasn't local to Airdrie at the time of her death, why would she be on the memorial? I will look into it more as I think I was a bit brain-strained when I looked first time round.